Greek carrier Aegean Airlines will start serving London Heathrow twice daily from Athens International Airport Eleftherios Venizelos (ATH) on October 25. The airline already serves London Stansted Airport from Athens twice a day. Aegean’s new Heathrow service will replace its Stansted flights, it is understood. It is clear that a primary driver for Aegean’s decision to serve expensive, cluttered Heathrow ― still Europe’s busiest international gateway airport ― is the airline’s forthcoming membership in the Star Alliance from May 2010. Serving Heathrow provides a raft of new opportunities for Aegean to codeshare on its Star partners’ transatlantic and long-haul flights from the major airport. After Aegean completes the process of integration necessary to join the Star Alliance, which is expected by June 2010, the company says its goal at Heathrow is to develop partnerships with North America-based Star Alliance members which serve Heathrow, such as United, US Airways, Air Canada, and Continental. The Greek airline’s aim is to offer its passengers improved access to final destinations in North America. Aegean will use Terminal 1 at Heathrow. Most if not all Star member airlines are using the airport’s Terminal 1 or Terminal 3. Aegean, now Greece’s largest airline, says it has timed its ATH-LHR flight departure and arrival times to be very convenient for both business and leisure travelers. The airline has also arranged its return flight schedule from Heathrow to allow for excellent connections with Aegean’s domestic destinations. The carrier, whose flight code is A3, says its ATH-LHR schedule will see flight A3 602 leaving ATH at 9:10 a.m. and reaching LHR at 11:15 a.m. Later in the day, Aegean’s flight A3 606 is timed to depart ATH at 5:20 p.m. and to arrive at LHR at 7:20 p.m. On the return sectors, flight A3 603 is scheduled to depart LHR at 12:45 p.m. to arrive at ATH at 6:30 p.m., while flight A3 607 is timed to depart LHR at 8:20 p.m. to reach ATH at 2:05 a.m.
Aegean Airlines will operate its London Heathrow flights with Airbus A321s in dual-class configuration. In-flight service will offer all passengers a full meal and an in-flight entertainment system with six music channels and a movie, all free of charge. Business class passengers get improved seat comfort and a choice of meals, as well espresso or cappuccino. In 2008 Aegean carried 6 million passengers, an increase of 14 per cent over 2007, to beocme Greece’s largest airline in terms of passengers carried. The company currently operates a fleet of 31 aircraft with an average age of 2 years. Aegean operates scheduled flights to 17 Greek destinations: Athens; Thessaloniki; Heraklion; Chania; Rhodes; Kos; Samos; Mytilene; Chios; Alexandroupolis; Mykonos; Santorini; Kavala; Limnos; Corfu; Ioannina; and Kefalonia. Aegean is also a regional partner of Lufthansa, providing access for its passengers to Lufthansa’s global network. Within its 10-year scheduled services history Aegean has won awards six times from the European Regions Airline Association (ERA) in recognition of its operating performance, commercial success and customer service. Additionally, Aegean has been repeatedly awarded by Athens International Airport as the single largest contributor to the airport’s passenger growth. 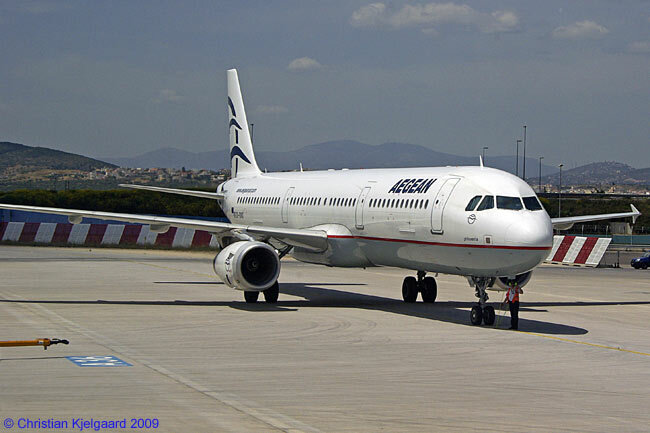 Aegean also recently received the Skytrax World Airline award as the best regional airline in Europe for 2009. How in the world to I check your arrivals and departures for some guests I am awaiting on your flights?